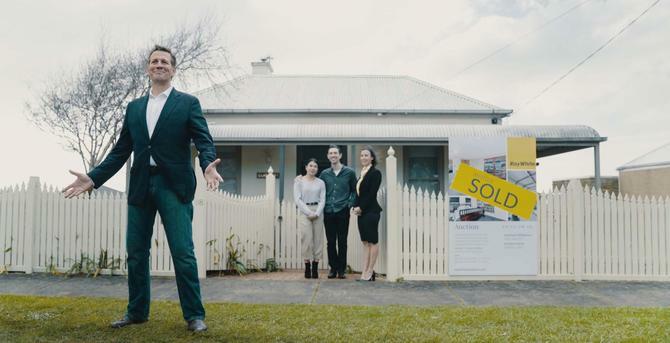 The decision to launch Ray White’s first brand campaign in its 116-year history is a big step towards realising the power of marketing to drive business growth, its marketing chief said. Historically, Ray White has focused primarily on property marketing, internal and broker campaigning, making this a first for the brand, head of marketing, Lisa Pennell, said. The latest campaign is also about breaking out of category and showing how the organisation can help consumers realise their property ambitions. Pennell, who has been working on the real estate giant’s senior leadership team for the past 17 years and who took over as head of marketing in January, said it was time for the brand to better articulate its Australian heritage, scale and market impact. Ray White and its franchise network of more than 1000 offices now operates across 11 markets and sold more than $45 billion in property last year. The fresh above-the-line campaign, dubbed ‘Great’, focuses on exploring the great Australian dream, with Ray White helping Australian consumers as they look to build out their property aspirations. It’s couched in Australiana, detailing unique idiosyncrasies along the way and the country’s love of labelling things great, and features Australian actor, Rhys Muldoon. “We’ve always been great at property marketing, and grown at an exceptional rate in the last 20 years, making us twice as big as our nearest competitor. But a lot of our customers don’t realise that,” Pennell told CMO. “They also don’t realise Ray White was a real person who founded this business in 1902, and that the group is still privately owned by the family. These are great brand features that weren’t broadly known. Launched on 15 September, the campaign includes in-cinema advertising, TV and radio in select areas, print, digital and social elements. Ray White brought on new creative agency, Do, to help craft the brand program. It anchors around a 60-second Ray White ‘Great’ film, Great 60. Pennell said the media mix is not completely fixed, and the team is keen to learn and optimise along the way. For example, digital emphasis initially will be placed on social and YouTube. “With anything we do there are learnings along the way… we want to try a bit of everything and see what gets traction for us,” she said. It’s also the first milestone for Pennell as executive-level marketing chief. She said her appointment earlier this year was recognition of the need to make marketing a growth lever and better align efforts with the business strategy. “We wanted to align the function more closely with our business strategy and that’s been my focus for eight months,” she said. “We paid little attention to brand or broad-based marketing until about five years ago, and we’ve had a couple of different attempts at how we harness the power of marketing. But this is our first real glimpse into what marketing can do for a business. “We’re not a business that’s aspiring to be the biggest or best – we already are. It’s just people don’t know it. How exciting is that – you’re telling a story already true. It also comes after Ray White dipped its toe in the water with an April Fool’s Day video, which gained significant earned media and saw Ray White positioned alongside brands such as Virgin and P&O Cruises. “We were featured against other well-known brands and that’s increased the appetite to do more in that space,” Pennell said. Alongside her new role and the appointment of a creative agency, Pennell has brought on a social specialist, and realigned existing communications, PR and marketing staff underneath a more robust and solid marketing strategy. “Finding the right people, and building the right strategy and culture is just as important as all these creative elements,” she said. As part of the senior leadership team for many years, Pennell said she’s held a number of hats and worked on previous campaigns and projects, along with brand protection, conflict and mediation, and ensuring customer experience standards. Her background is in communications and PR. In terms of building buy-in for the brand investment, Pennell said it was a matter of getting “belly to belly” with the executive and leadership teams, as well as the networks. She’s spent the last few weeks going around the country talking to principals, sales people, managers and operations around the campaign and what’s available. Each franchise has the opportunity to build off the campaign within the brand guidelines, and Pennell said some individual locations and zones have taken the opportunity to invest in further media and local activities around the new campaign. “The exciting thing is the enthusiasm with which the campaign has been received by the network – I’ve not heard any negativity, and the excitement is amazing,” she said. Pennell described the brand campaign debut as the first big step in elevating brand awareness and said she was also looking for engagement and ultimately conversion as the team brings further elements to market.